March « 2016 « They Said What? Cancergate: Did a Koop Award Committee Member Commit a Crime? March 29, 2016 12:48 pm / 2 Comments on Cancergate: Did a Koop Award Committee Member Commit a Crime? As part of the cover-up of Health Fitness Corporation falsely claiming to save the lives of 514 Nebraskans with cancer, someone doctored their Koop Award application to remove the evidence of that claim and replace it with a literally and figuratively much more benign statement. For reasons described below, this may not even be legal. We are offering our assistance to Ron Goetzel to help him find the perp. What would Dr. Koop say? 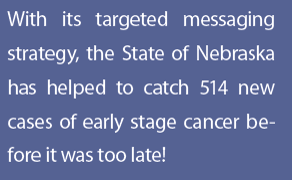 At the 2015 Great Debate, Ron Goetzel (who runs the Koop Award Committee) insisted that the Koop Committee knew nothing of the original lie about finding 514 cases of cancer, even though that line appeared twice in the original Koop Award application. The Koop Award Committee also saw nothing suspicious in HFC’s marketing materials, which, incredibly, still resided on the HFC website for years after HFC was outed. HFC finally took it down, an obvious admission of guilt on their part (to go with the actual admission in the newspaper), given how much they had ballyhooed it in the past. Naturally we have copies of the entire “case study” if anyone would like one. The Koop Committee missed this, though. Claiming to know nothing and see nothing — the Sergeant Schultz defense — is a Koop Committee favorite. However, the initial oversight doesn’t explain why Ron has called Nebraska a “best practice” three times even after he was shocked, shocked to learn that lying was going on in here. I want to be very clear: we are not accusing Ron Goetzel of sneaking back in and rewriting the original applications (including forging a section of a letter from the governor of Nebraska) to cover up the lies told by Health Fitness Corporation, which sponsors his award. He could lose his job at Johns Hopkins if he did, so he wouldn’t. Quite the opposite, both of us would want to get to the bottom of this! Owing to the previous doctoring of original evidence in the Koop Award (for which Ron Goetzel did admit responsibility), we now know to keep screenshots of originals. Note the difference in the last sentences. The original is claiming “514 new cases…of cancer” below. This is the original that Mr. Goetzel insists did not appear in the application. And yet, here it is. The doctored paragraph has now replaced the original paragraph in both places where it appears. Ours is the only extant copy of the original screenshot. We learned long ago that you need to capture screenshots because these people always cover their tracks when they get caught lying. And since most of wellness is a lie, they have a veritable Pennsylvania Station of tracks to cover. The perpetrator is in a lot of trouble: In the application, this altered phrase appears in a letter from then- Governor Heineman’s office in support of the Koop Award. Obviously that’s not legal. The reason we assume Ron Goetzel didn’t do it is because he would have had to get permission from Johns Hopkins, and they would not have let him forge official state documents while using their affiliation in his title. We don’t know who the perpetrator is, but one reason to doubt that Ron Goetzel is the guilty party is that he was already caught doctoring original Koop applications, and it wasn’t fun for him. Hence, one could assume he would be unlikely to do the same thing again. So Mr. Goetzel is a victim here too because of the Koop Award’s shattered credibility. He should be as horrified as we are, and we should work together on this, and offer our help. We urge, demand, insist that as the leader of this committee, Ron Goetzel get to the bottom of this! He needs to find out who tampered with this letter from the Governor, turn him in to Nebraska authorities if indeed that is illegal, apologize, and rescind that Koop Award. We can’t investigate this ourselves without his cooperation. Even if we knew who it was, we can’t convene the wellness industry ethics committee because in wellness, there is no ethics committee. That’s because in wellness, as this website has repeatedly shown, there are no ethics. The regional business coalitions seem to have consistently excellent conferences. The upcoming 36th Annual Conference in Chicago (May 5 to 6) is likely to continue in this tradition, with a great agenda, venue, and attendee list. I look forward to meeting many of you there. The good news is, unlike many conferences, if you tell them you’re a friend of mine, they’ll still let you in. By way of background and it’s a bit confusing, the regional business groups on health are loosely affiliated with the National Business Coalition on Health (NBCH), not the National Business Group on Health. While they have very different philosophies, there is good news about both organizations. The good news about the former is that they are not nearly as dependent on wellness vendor dollars as other organizations, so it is important that you support their efforts to bring unbiased and thoughtful discussions into their conferences, starting with this one. In addition, the NBCH has recently continued its tradition of strong management with the appointment of Mike Thompson to the CEO role. The good news about the latter is, according to the law of averages, they should soon be saying many intelligent things. Nina Teicholz, author of The Big Fat Surprise, was kicked off the Food Policy Panel. Likewise, qualified proposed replacements, such as the Harvard-affiliated leader of the Joslin Diabetes Center obesity program, were also nixed for political reasons. The back story is here — a carbohydrate defender was selected instead. The replacement person in question works for an organization called — and we still have several days left in March so you know I’m not making this up — the Alliance for Potato Research and Education. I know what it’s like to be excluded from panels due to the threats posed by one’s ideas. (In my case, the “ideas” are mathematical proofs, of course.) It may be that Teicholz’ ideas are wrong — she doesn’t believe the science supports a diet low in saturated fats and fats generally (which necessarily means substituting more carbs) — but they deserve an airing. Remember, for years we were told that dietary cholesterol was bad for us (Cerner still puts that in their HRA)…largely because debate was stifled. If we learned anything from that debacle, it’s this: the carbs-vs.-saturated fats needs to be debated. Just like “pry, poke and prod” programs, our country’s nutrition policy — and hence, School Lunches, WIC, and everything taught by every MD, nutritionist and dietitian in the country — survives only because dissenting views (or proofs, in the case of wellness) don’t get aired. Here is the petition. Please sign it if you would like to see carbs-vs-fats debated. Personally, I am fairly agnostic on this carbs-vs-fats debate itself. 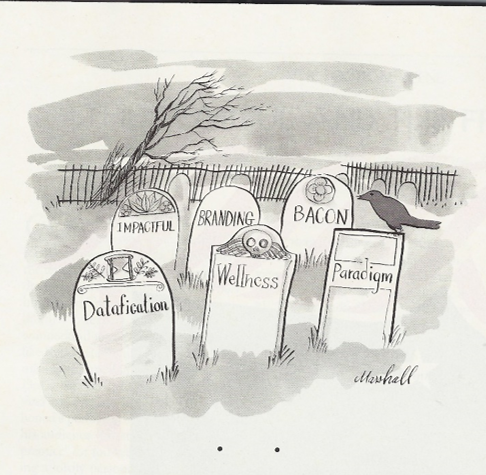 Unlike wellness vendors, I see human physiology, genetics and psychology in shades of gray. Data influences my opinion. It’s called the “scientific method.” That’s why I switched overnight from being the biggest advocate of wellness/disease management to the biggest critic — because we had all been measuring the data wrong. In the case of fats-vs-carbs, my view would be that the jury is still out, and/or there may be an undiscovered or unappreciated “x-factor.” Or, it’s possible that some ethnicities or individuals react differently to different nutrient groups–just like they have different susceptibilities to diabetes. So what I’m not agnostic on is this: we need a debate! Are Participation-based Findings Invalid? The Wellness Industry Thinks So. March 24, 2016 2:00 pm / 2 Comments on Are Participation-based Findings Invalid? The Wellness Industry Thinks So. Likewise, I stand in awe of the wellness industry’s willingness to defy all rules of math, plausibility, science, biostatistics, integrity, and common sense in their commitment to the participants-vs-non-participants study design. In a nutshell, wellness apologists would have you believe the following: If you divide a company into employees who want to lose weight vs. employees who don’t, that the difference in “before” and “after” weights is due to the program, not the difference in motivation to lose weight. And, further, that people who start in the motivated category but drop out, shouldn’t count at all. If this study design made sense, the FDA could dispense with double-blinded trials. They could simply compare people who are eager to take a certain drug to people who could care less about taking the drug. And what if someone taking the drug gets major side effects and drops out? Heck, don’t count him at all. Pretend he never existed. Silly? Of course. But “silly” is what wellness is all about–and I’ve just described their study design. Let’s consider the evidence. The beauty of this evidence is that it constitutes what a litigator would call “admissions against interest,” meaning that the perpetrators’ own statements invalidate their own case. We don’t need to prove we’re right–the wellness industry proved it for us. Moreover, they did this despite massive investigator bias and publication bias in their attempt to show the opposite, sprinkled in with an attempted cover-up by Mr. Integrity himself, Ron Goetzel. Participants were separated from non-participants but not offered a program to participate in? 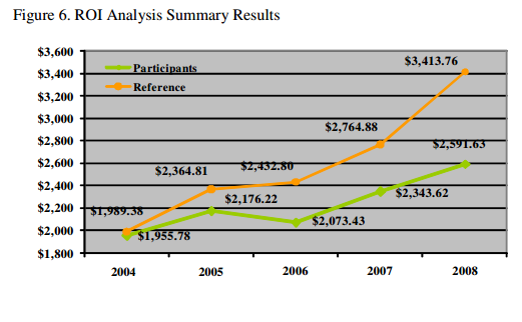 A program gave bad advice, the advice was taken…but participants still showed savings? A controlled experiment tested participation impact itself against program impact? 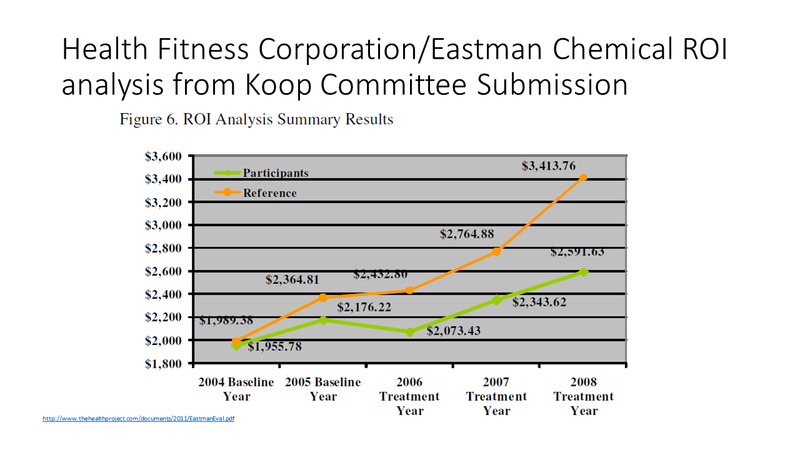 The slide below — blessed by the entire Koop Award Committee — clearly shows increasing savings over the two years of “baseline years” before the “treatment years” even started. Phantom savings reached a whopping $400/year/employee by 2006…without doing anything! This was the example where Ron Goetzel, who had already known about this misrepresentation of savings, went back into the original Koop Award application and doctored it, removing the bottom axis altogether in order to prevent readers from seeing what really happened. And then he wrote in Health Affairs that the “original is online and subject to review,” when in fact it wasn’t — only his doctored version was. Coda: by the end of the 2008, the “savings” for Eastman participants exceeded $900/year…but average participant risk declined only 0.17 on a scale of 5. Yet they won a Koop Award. Is this a great country or what? By getting people to eat more carbs and less fat, Stanford researchers showed a reduction in costs of $397 in the first six months alone, or roughly $800/year, or about $2000 in today’s dollars. Since participant risk factors only declined 2.2% and since some of the advice was demonstrably wrong, the only thing (besides regression to the mean) that could explain this result is simply being willing to participate, even if you do the wrong thing. Yet despite the obvious invalidity, this study was selected for inclusion in Professor’s Baicker’s 3.27-to-1 paean to the wellness industry. Without invalid studies she wouldn’t have been able to perform a meta-analysis in the first place. Nor should there have been any difference. Subjects were Invited specifically because they were not chronically ill or even at risk for being chronically ill. Hence there was no opportunity for improve health status in a clinically meaningful way, especially in only 12 months. Further, the program itself was based on the highly questionable proposition that telling people they had a gene for obesity would motivate them to lose weight. Yet, the participants in Group PO saved $1400+ as compared to the non-participants in Group PO. Just to be clear: once both those subgroups were totaled and compared to Control, any savings — or as shown above, health improvement — went away. These are just the three most self-evident cases. But if you look hard enough, you’ll see a pattern in wellness, especially among award-winning programs: risk factors among participants barely budge, but huge amounts of money are saved. Nothing is ever plausibility-tested even though the HERO Guidelines urge such an event rate-based test. At this point the best argument for hiring a “pry, poke and prod” vendor is that the economy depends on it. If you don’t keep sending these people money the entire country might slip back into recession. Breadlines could form. But the good news is that bread is a key component of a lowfat diet. Conventional “pry, poke and prod” wellness died last month, when Ron Goetzel, in an unexpected and unprecedented display of candor, announced that only “about 100 programs” have succeeded, but “thousands” fail. That failure rate validates what we’ve been saying all along: wellness isn’t an industry–it’s a lottery. It was worth all the abuse I’ve taken for the satisfaction of seeing Ron — and most of his cronies — finally succumbing to proof. Ironically, that means cutting way back on your screenings, to a level that adheres to US Preventive Services Task Force guidelines, and investing the savings in your culture of health. But this post isn’t about how to create such a culture, an undertaking whose complexity and direction will vary by organization. This post is about how to measure it. It’s a clip-and-save (or download-and-file) set of metrics that might be expanded or otherwise modified over time, with reader input. Having said that, I would continue to measure one health outcome metric: “wellness-sensitive medical events (WSMEs),” as recommended in Why Nobody Believes the Numbers and now (albeit reluctantly) recommended by HERO. Most importantly, that metric is a mainstay of Intel’s esteemed Validation Institute. The V-I has bestowed recognition on a select handful of health plans — Blue Cross of Louisiana, Blue Cross of South Carolina, Harvard Pilgrim, Novacare, Presbyterian, Providence. You can see from the links how they use these measures to track (and reduce!) WSMEs (or just disease management events, depending on the plan). That measure is objective. WSME rates respond to both disease management and wellness. There is no selection bias, no regression to the mean. It is the single best indicator of control and avoidance of chronic disease. A “culture of health” can’t be measured with facile blood values or weight. You need to measure culture, not lipids. And you need to do it without lining up employees to be weighed or otherwise inconvenienced or even humiliated. Weigh-ins disrupt your organization both literally and figuratively…and not in a good way. Quite the opposite, my experience running a NASDAQ company steers me to measures that don’t disrupt operations to collect data. Those would be easily collectible, objective, and population-wide measures. Remember, you need the support of line managers, and an excellent way to get that support is bringing them insights, not taking their staff off the job. Let’s start with absenteeism. All-cause absenteeism is a great metric because absenteeism rates reflect not only illness, but stress, depression, and general job dissatisfaction – all indicators of a healthy culture. It’s not that easy. For starters, organizations must first distinguish scheduled from unscheduled paid time off. Once you’ve done that, here are several things to consider. Focus on changes in absenteeism, not absolute levels. We don’t have a benchmark. Benchmarks will vary by industry anyway. Measure everyone, not just “high-risk” employees who were in an “absence management program.” That is pure regression to the mean. The 20% who were most often absent last year will mostly not be the 20% who are most often absent this year. So your program will always show success but your overall lost work days likely won’t decline. Next, recruitment/retention. What are your rates? Why do people say they want to work at your company? What do they say on exit interviews? Do you force-rank employees or track the ones you most want to keep? Compare your retention rates for them to other employees, who may stick around only because they don’t have other attractive options for employment. Finally, some process-oriented organizations (like manufacturers) have easily measurable productivity standards. Rework/defect rates might be one measure, though that could have a high signal-to-noise ratio. If specifically health is being measured, rework/defect/incident and other productivity measures towards the ends of shifts could be contrasted with rates earlier in the day. If a healthy workforce in a healthy culture does anything, it should be avoiding fatigue…and mistakes due to fatigue should correlate with continuous hours worked. Each of those is a top-line measure, that would then lead to root-cause examination…and at this point we can’t offer a one-size-fits-all solution (though my colleague and co-owner of this blog, Vik Khanna, consults on this topic). But that’s what measurement is all about—measure, manage, and then re-measure. This difference is that for culture of health measurement, let’s start with valid measurements instead of repeating the mistakes of the past. This is just a starting point. We look forward to your comments, here and on linkedin, to refine these measures and take them to the next level. Perhaps we will post an updated version including those new ideas. This Huffpost points out how wellness is a microcosm of the political disconnect between the “establishment” and the “insurgency.” The Business Roundtable is all-in for it, as is Congress and the White House (meaning BOTH parties). And yet the people — the actual voters — are dead set against it. We’ll be starting a series soon on wellness done FOR employees vs. wellness done TO employees. This Huffpost is excellent background on why the latter is quite literally the most unpopular part of the entire Affordable Care Act — regardless of whether you like the rest or it or not. Make the whole thing so complex that employees won’t be able to figure out what you’re talking about and employers won’t be able to administer it. And that is indeed exactly what Hodges-Mace is proposing in this week’s Employee Benefit Advisor. Even though I’ve visited the Hodges-Mace website, I can’t figure out what they’re selling, but whatever it is, this article isn’t exactly a ringing endorsement for buying it. If the employee fails to comply, she must pay the surcharge, and it is this practice that encourages higher participation rates than traditional wellness programs and generally results in a positive ROI for these programs during their first year. The author, Hodges-Mace’s Eric Helman, says: “Employers are moving to simpler programs with tangible results and nearly immediate cost savings,” like this wellness-or-else program Hodges-Mace is advocating. How “simple” is this program? If the employee chooses to participate in the program, the system has to verify her compliance, a process that typically entails multiple reminders, follow-up communications and documentation from the PCP. The benefit system must be able to seamlessly accept information from the verification process, calculate and apply surcharges, and then communicate the appropriate information to the payroll system. These actions and the rules they are based on must also be integrated into the process of handling qualified life events. In other words, it takes a lot of complexity to make a program simple, a lot of spending to save money, and a lot of harms to benefit employees. Hey, I know it isn’t always about Quizzify, but we try to un-teach exactly what Hodges-Mace and other wellness companies teach: Astronomy is not a health issue. Don’t schedule a checkup just because the earth completes a revolution of the sun. We educate employees on when and when not to visit the doctor. Avoiding useless checkups–now that’s something that really will save money right away. But we should caution: even though the science is overwhelming and the economics are transparent, it still takes months for us to get this message across. Unlearning incorrect information is not easy…and it doesn’t help that wellness vendors are teaching the opposite.